I can’t believe it’s been almost 2 years since Amy and I moved from Atlanta back to our home state of Florida. 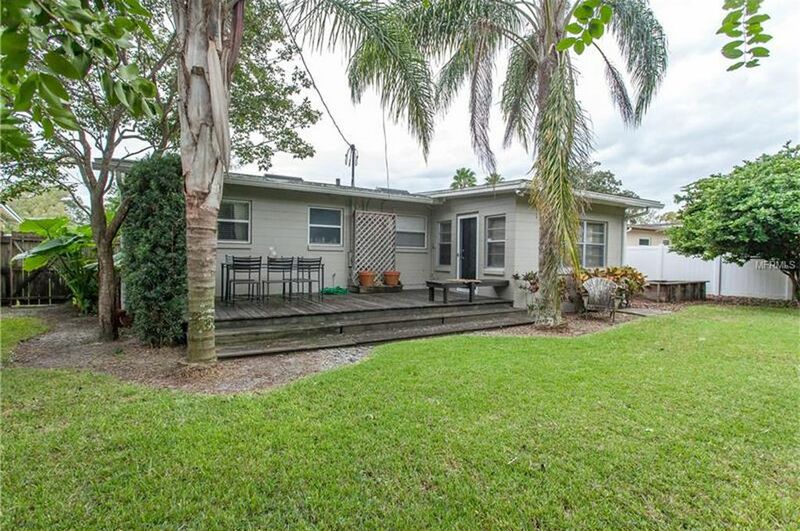 We rented a place in Winter Park for our first 6 months and then in early 2017 (actually between Christmas and New Year’s) we moved into our cozy, mid-century ranch home in Orlando’s historic Audubon Park neighborhood. Unlike our epic “Pulley House” project in Decatur or our 1970s cabin house in Columbia, we haven’t really done much renovating. Read OnQFinancial’s blog post about USDA loan requirements to find out about your possible eligibility for such a loan. In fact, looking back at the listing photos from December of 2016, the house is still pretty the same and honestly, fairly true to its original 1959 form. I’ll use those listing photos to give you a quick tour. As you can see, the landscaping is lush and mature. Thanks to the wet, Central Florida weather and an irrigation well, our plants and grass stay pretty happy year-round. We took down the flag, replaced the porch light fixture, and lost one of the trees by the road to hurricane Irma, but otherwise, the front of the house still looks just like this. When you walk in the front door, you can see all of the main living spaces and the beautifully seasoned hardwood flooring. We ended up installing our TV on the wall where the photos are and our dining table is centered rather than being pushed against the wall. 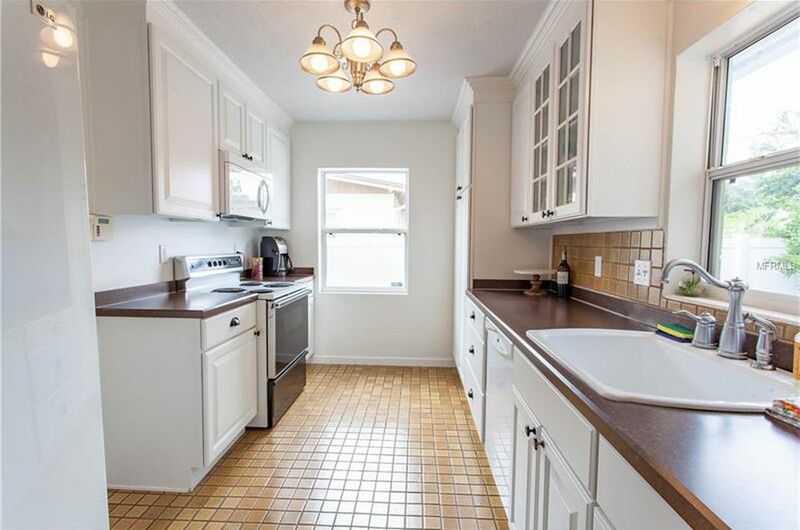 The kitchen is a little tight but has a door on the left out to the single car garage and laundry area. We replaced the light fixture pictured here with some contemporary LED track lighting and upgraded the cabinet hardware with brushed nickel pulls. We have plans to replace the countertops and install new tile flooring and backsplash, but we haven’t got around to that yet. 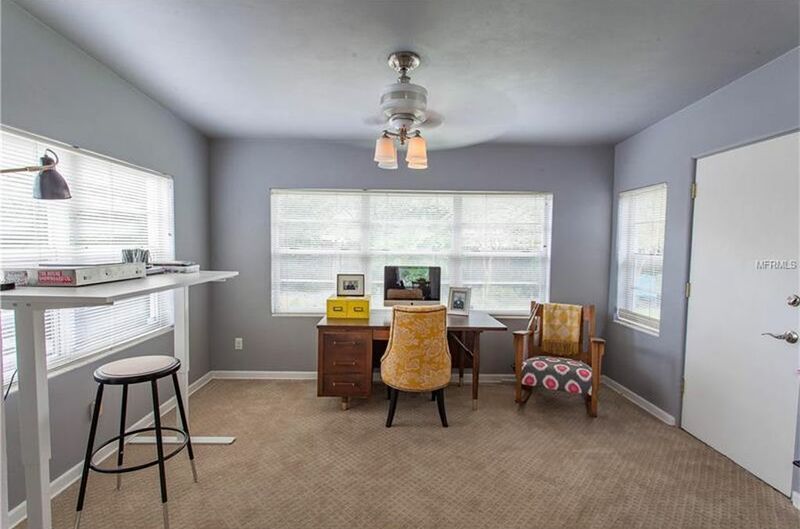 In the sunroom, we added some storage cabinets but have a very similar standing desk in exactly the same spot. We put a small art table for the kids where the traditional desk is and replaced the ceiling fan. This is still the only room in the whole house with carpet. Our cats love it, but we’re planning to tear it out eventually and replace it with tile. All 3 of the bedrooms are down the hall to the right of the living room. In the first one, we put in a ceiling fan, installed a closet organizer, and called it done. Both of the bathrooms are still mostly original. We ended up replacing a leaky, three-handle shower valve with a new single handle valve. We also swapped out the mirror but don’t plan to do much else in here. If you are searching for a good enclosed shower for your bathrooms, then I would suggest you go to Shower Enclosure to know more. 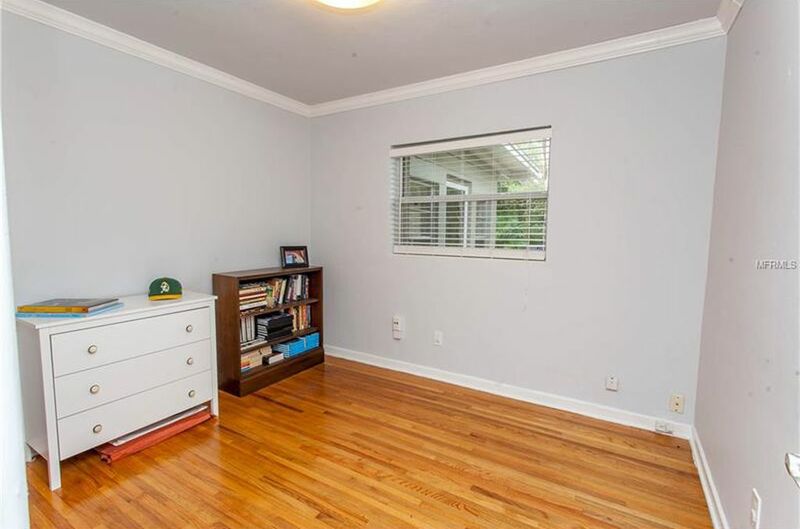 The 2nd bedroom is actually slightly larger and has more closet space than the actual master. We’re slightly jealous but decided it only made sense to claim the room with the attached bath as our own. At the end of the hallway is the master bedroom. We tried a couple different layouts and while our bed and nightstands look completely different, they still ended up in the same location. There’s not enough wall space for a dresser, so we put a short one at the foot of the bed to supplement our 6′ wide, shallow closet. 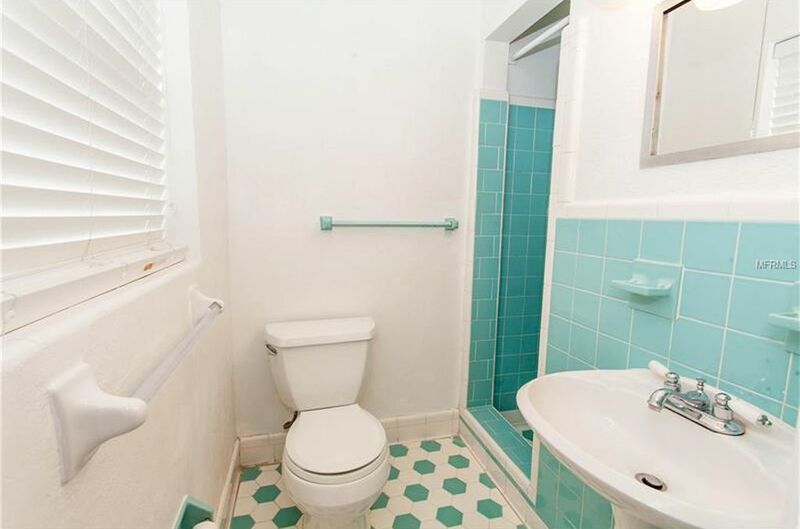 We love the original teal tile and accents in the master bath and I’m sure a teal toilet was probably involved at some point as well. This is one of the many places in the house though where we wish we had a little more room. 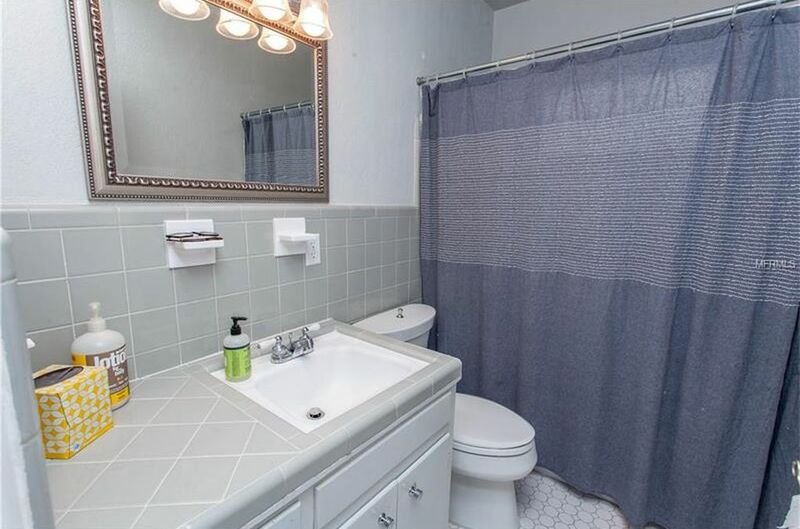 The only way for two people to occupy this bathroom is if one is in the tiny shower stall. The back yard is one our favorite features of this little house. It’s a vibrant oasis where our daughters play almost daily – catching lizards, swinging on the second-hand play set that we installed, helping maintain our herb/vegetable garden, and running through the sprinklers in the hot Summer months. We enjoy grilling and eating on the deck and have talked about the possibility of converting at least part of that space to a covered, screened porch. There’s a lot of things we love about our home but talks of upgrades like a screened porch or a kitchen reno have been on hold as we re-evaluate our needs and desires for our family dwelling. Those desires always fall into one of two buckets: Space & Inspiration. 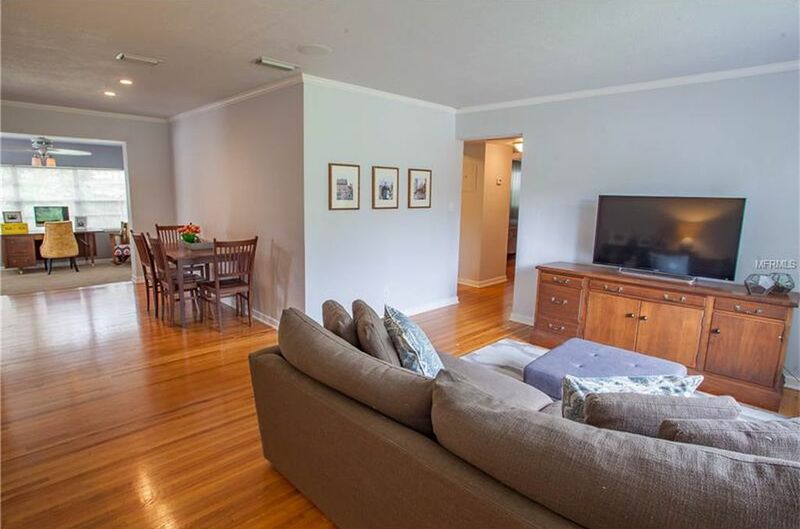 At 1,300 sqft, our mid-century ranch home doesn’t fit the definition of a tiny house but it’s still about 30% smaller than either of the two houses we bought before having kids. That part was intentional. We wanted to down-size, simplify, and attempt to live in a more minimalist lifestyle. We certainly succeeded in that goal but it made us realize where we value extra space the most. A bigger bathroom, a slightly larger bedroom, and a more open kitchen are at the top of that list. A 4th bedroom isn’t a necessity but it would give us more flexibility when family and friends visit and more importantly, could double as a closable office when working from home. Oh, how we miss the kitchen we designed for the Pulley House. Even greater than the need for more space is our longing for a house with character. We put a lot of work into our first house in Columbia and even more into The Pulley House to create living areas that we were not just proud of, but that inspired us. We love to dream big, take risks, and challenge the status quo and have realized that those characteristics about ourselves have been amplified in the past by our home environment. Some examples of the home features that we’re most excited about are exposed beams, vaulted ceilings, open floor plans, mono-pitched roofs, clerestory windows, and terrazzo floors. You can see some of those things represented in the “Contemporation” Pinterest board we started while working on our last house. 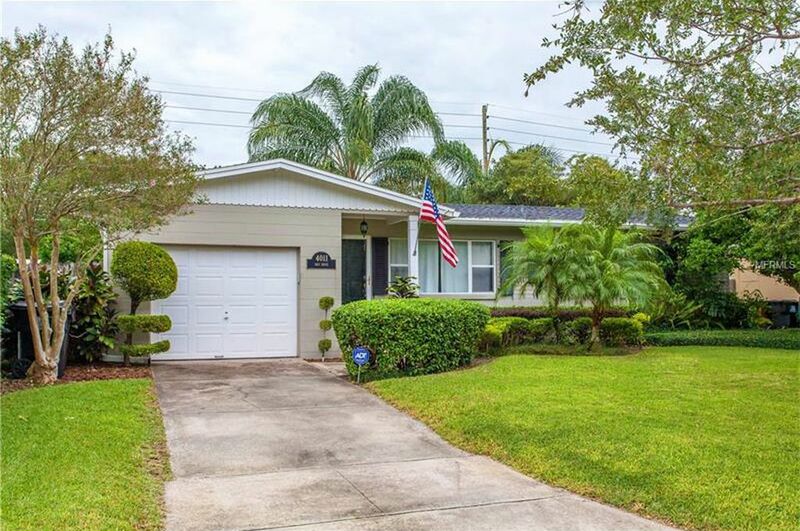 Those features are also hallmarks of the mid-century modern home style and there are so many of those here in Central Florida. 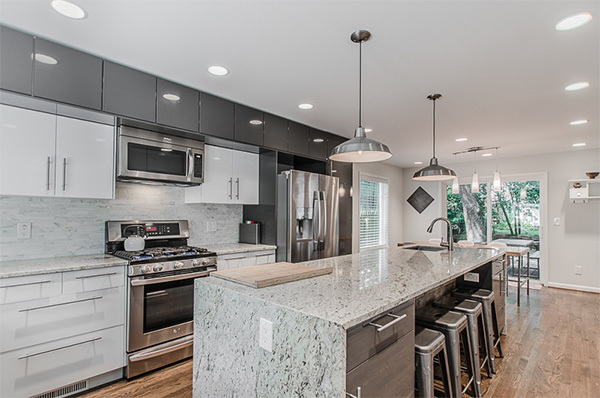 We’ve seen a few local, mid-century modern homes in Orlando that have been meticulously maintained that are absolutely gorgeous. Sadly though, many of them have fallen into disrepair and some have been demolished and replaced with boring infill. Still, there are a bunch of gems out there just begging to be restored back to their former, futuristic glory. About a year ago, we met a couple that is doing exactly that with a MCM house in our neighborhood. 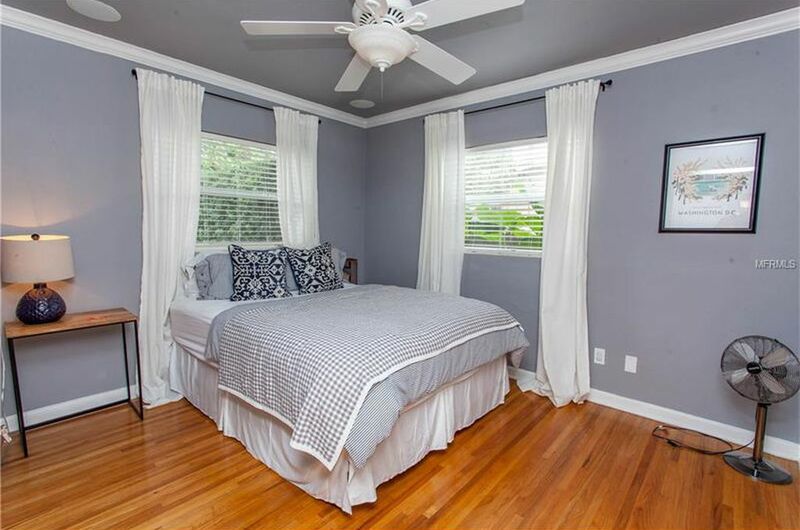 They post about their renovation adventures and inspiration as orlandoabode on Instagram. They’ve dubbed their project, “The Panda House” and while their style is a little different than our own, the transformation has been fun to follow. 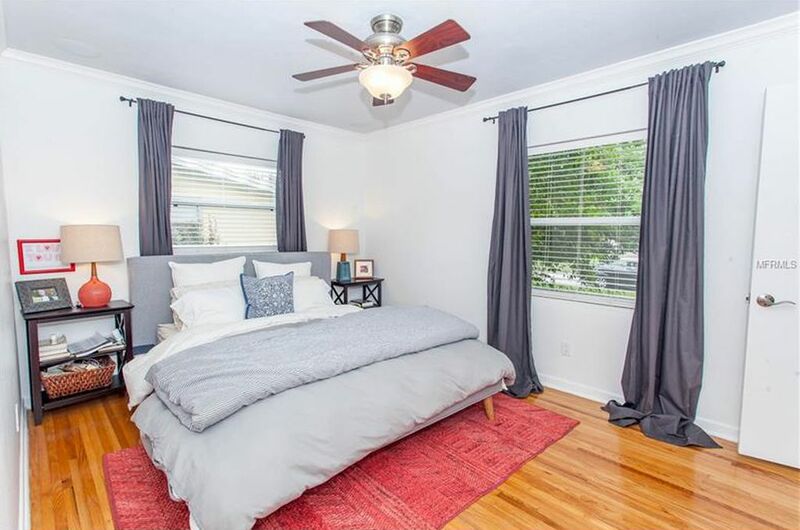 Their place was a neglected mess obscured by overgrown landscaping and is a great example of the type of distressed property we’re looking for. We’ve been watching everything that hits the market in the neighborhoods we’re interested in for almost 3 years now. The problem is that in a housing market with skyrocketing home values, it’s hard to beat the investment flippers. We’ve seen a lot of great diamonds in the rough, and have even made offers on a few only to get beat out by cash offers. Often times, those homes pop back on the market in a few short months with questionable cosmetic upgrades and a much higher price tag. If we want to keep our kids in the same school they’re in now, that obviously narrows the field even more. We’ve even talked about the possibility of buying a tear-down property and designing our own mid-century-inspired dream home but we’d much rather rehab an original. Will we get to do that? Only time will tell. For now, thanks to our cozy ranch home, we’re in no rush. We’ll just keep patiently watching for our next exciting renovation project.